Bangladeshi economist Muhammad Yunus has urged world leaders to get on with the fight against poverty, upon receiving the Nobel Peace Prize. He has called on world leaders to stop spending money on wars like the one in Iraq. The 63-year-old and the Grameen Bank he founded have won the peace prize for their work to lift millions out of poverty by granting tiny loans to the poorest of the poor, especially women in rural Bangladesh. 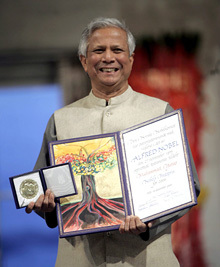 Mr Yunus and Grameen Bank representative Mosammat Taslima Begum have received gold medals and diplomas at a ceremony at Oslo's City Hall to applause from about 1,000 guests. In the prepared text of his acceptance speech, Mr Yunus says the link between a peaceful world and fight against poverty is clear. "Poverty is a threat to peace," he said. He says the new millennium began with a dream to cut poverty in half by 2015, as agreed by world leaders in the United Nations millennium goals in 2000. "But then came September 11 and the Iraq war, and suddenly the world became derailed from the pursuit of this dream, with the attention of world leaders shifting from the war on poverty to the war on terrorism," Mr Yunus said. "I believe terrorism cannot be won over by military action." Mr Yunus says the world must tackle terrorism's root causes. "I believe that putting resources into improving the lives of the poor people is a better strategy than spending it on guns," he said. Mr Yunus says it is necessary to provide opportunities for people to live decent lives in order to build peace. He and the bank have received the peace prize "for their efforts to create economic and social development from below", according to the award citation. Their work lending small sums to help start businesses, from basket weaving to chicken farming, has pioneered a global movement known as microcredit. The award has traditionally gone to statesmen, peace-brokers or human rights advocates. Norwegian Nobel Committee chairman Ole Danbolt Mjoes says by giving it to Mr Yunus, the group seeks to shine a spotlight not only on the fight against poverty but also on dialogue with the Muslim world and on empowering women. "Microcredit has proved itself to be a liberating force in societies where women in particular have to struggle against repressive social and economic conditions," Mr Mjoes said. He also says a "widespread tendency to demonise Islam" has been seen since the September 11 terrorist attacks and the Nobel Committee wants to "narrow the gap between the west and Islam". - via google news, from Reuters. Terrorism will prevail until the world addresses its "root causes," Bangladeshi economist Muhammad Yunus said. "Terrorism must be condemned in the strongest language," Yunus said Sunday, but "we must address the root causes of terrorism to end it for all time to come." He said he believed "putting resources into improving the lives of the poor people is a better strategy than spending it on guns," the BBC reported. Yunus observed the United States had spent more than $670 billion on the war in Iraq. :: More news on this topic from google news. :: 'We can put poverty into museums' - Nobel lecture presented by Prof Muhammad Yunus at the Nobel Peace Prize ceremony on Dec 10, 2006 in Oslo.